Interested in participating as a CFRE candidate or as a mentor? Did you know that almost 35 members of the AFP Ottawa Chapter have their CFRE designation? You can do this too! 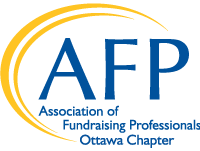 Your AFP Ottawa Chapter is committed to professional advancement and offers resources to help you as you rise to the next level in your career. Many of our local CFREs take part in the AFP Ottawa CFRE Study Buddy program. Through this program, aspiring CFREs come together regularly and are mentored by those who have already gone through the process. The group encourages and supports one another (and keeps each other disciplined!) to complete the detailed CFRE application form, to read books from the reading list, do practice tests, and ensure everyone is prepared for success. Participants in the study buddy program who wrote the exam were 100% successful! AFP Ottawa ‘CFRE Study Buddy Program’ typically begins in the early autumn. Please email Monique Washnuk at monique.quenneville@gmail.com for more information about this years program. Forms and Information: For all information about certification and to download application forms, please visit www.cfre.org. Recommended Books: Here are six helpful books in different areas that are all recommended reading for the exam. Most can be ordered through the AFP Bookstore or on line at www.amazon.ca. It’s worth noting that, because of the increasing number of CFRE's within the AFP Ottawa Chapter, you may be able to borrow most books on the CFRE reading list through the Study Buddies program. Ciconte, B. L. & Jacob, J. (2009). Fundraising Basics: A Complete Guide. Joyaux, S. (2011). Strategic Fund (3rd Ed). Mallabone, G. (2011). Excellence in Fundraising in Canada. Minton, F. & Somers, L. (2018). Planned Giving for Canadians (3rd Ed). Sprinkel Grace, K. (2005). Beyond Fund Raising (2nd Ed). Tempel, E. et al. (2016). Achieving Excellence in Fundraising (4th Ed). Note: The reading list, as published by CFRE International, may change from year to year. To ensure that the above books are still on the reading list, please refer to www.cfre.org. Best of luck and, if we can be of assistance, don’t hesitate to be in touch.